I created a chart a couple of years ago (inspired by a post I saw on Pinterest, of course!) to deal with students who blurted answers in my classroom. I haven't needed it since that year, but I do have a couple of little ones this year who are a little "over-eager" to share their ideas. It worked so effectively in fifth grade that I thought I'd dust the spiderwebs off of it for a post. It is still very early in the year, and I'd never pull it out to use with my students at this point in the year, but handled the right way it was very effective! I'd love to hear what strategies you have in your classroom to eliminate the "Blurts"! I'm having this problem with my fourth graders. Will you explain how the chart works? I think it can work however you need it to!! When there was a blurt in my room I removed one of the icons from the chart next to that student's name. I used a pocket chart behavior management system at the time, and my students knew that after their three blurts (in a day) they would have to flip their card. I can see now how it would also work with my clip chart behavior management. I also think that you can incorporate it in any way based on the needs and abilities of your own students! I hope that helps! Erin I love your blurt chart! I am using class Dojo this year with my kids and if they shout out they lose a dojo point. So far it's working but it's still early in the year...still in the honeymoon phase! That's a neat idea! 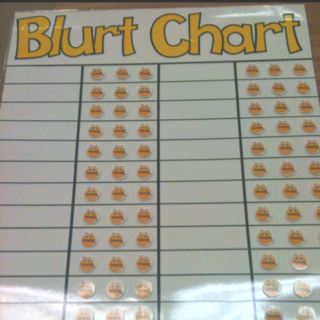 That was what I liked about the blurt chart... makes it visual so the kids actually realize they're doing it!